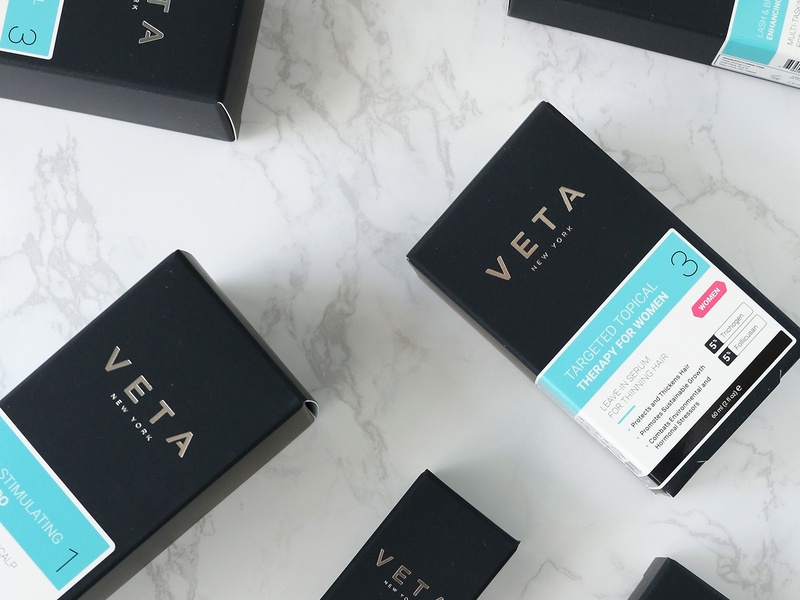 Veta combines key ingredients clinically proven to stimulate healthy hair and reduce thinning. Results show that these key ingredients and natural botanical extracts have a significant impact on the hair cycles of men and women experiencing hair thinning and loss. Trichogen™ VEG is a powerful association of selected components used in Traditional Chinese Medicine with some amino acids and vitamins, which allows the natural hair cycle to regain a normal state (measured by the ratio between anagen «alive» versus telogen «resting» hair bulbs). Decrease of hair loss and stimulation of hair, stimulation of metabolism, improvement of cellular oxygenation and skin/scalp microcirculation. Improvement of hair aspect and sensorial hair qualities, decrease of oily look, conditioning, repairing, improvement of the dry, dull look, increase of suppleness and easier combing. Improvement of scalp condition, balance of sebum secretion, decrease of dandruff and itching sensations. The scalp is healthier. Sulfopeptides of soy (Glycine max) (MW ~ 15,000 Da). Regulators of cell nutrition and growth, supply of bio-available sulfur, stimulation of protein biosynthesis. Amino-acids: derivatives of tyrosine, arginine, ornithine, citrulline: precursors of proteins and pigments. Aminosaccharide: glucosamine. GAG precursor for strengthening the extracellular papillary/peribulbar matrix. Vitamins of B group (PP, B5 and Biotin) take part in the regulation of cellular nutrition and lipogenesis: fight against any deficiency in B vitamins and oligo-elements. Zinc salt: regulation of sebum production. Panax ginseng and Arctium majus extracts: toning (local microcirculation) and antimicrobial effects. Silicone, quaternary polymer and hydrolyzed soy proteins: hair conditioners. A significant and dose-dependent increase of oxygen consumption by epithelial cells has been demonstrated, representative of an increase in cell metabolism/vitality. 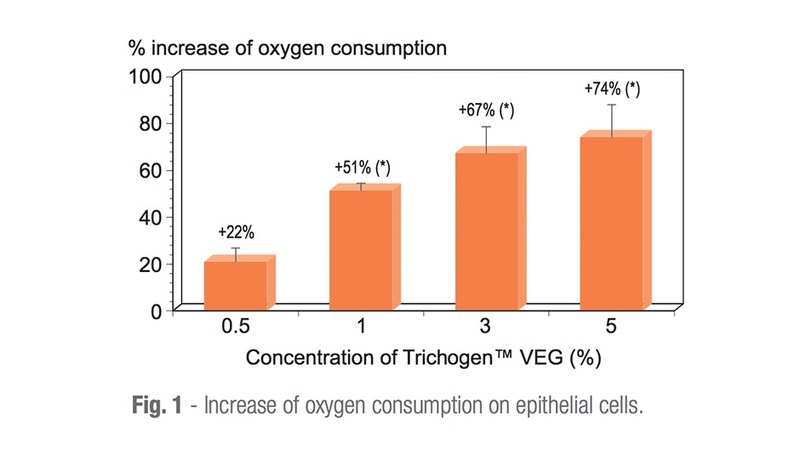 Trichogen™ VEG clearly improves cell vitality. 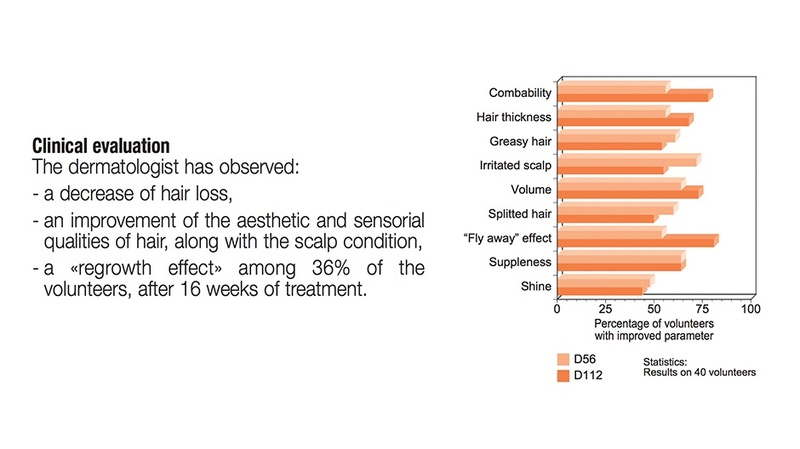 Follicusan™ DP stimulates the functionality of the dermal papilla cells at the base of the hair follicles, thus counteracting premature hair loss. It increases the number of anagen hair follicles (growth stage) and decreases that of telogen hair follicles (resting stage). 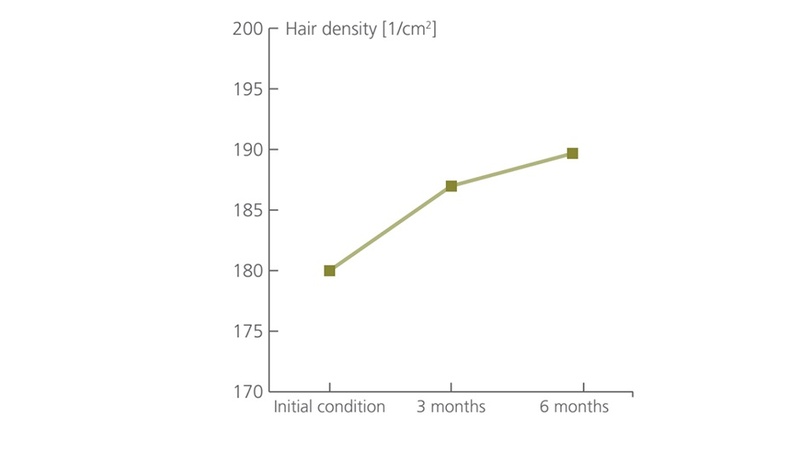 Hair density as well as cumulative hair thickness is increased. Dermal papilla cells are the most important cell type found in the hair root. A strong stimulatory influence of Follicusan™ DP on dermal papilla cslls was observed. This feature is essential for the development of new hair in order to increase the number of anagen hair and effectively fight hair loss. Density is the number of hairs per cm2 on the scalp. 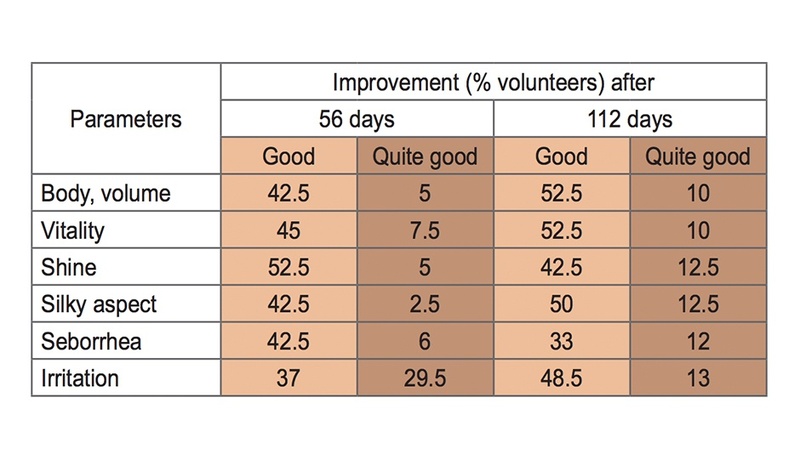 The 24 volunteers, suffering from alopecia androgenetica, showed a reduced hair density of only ~180 /cm2. 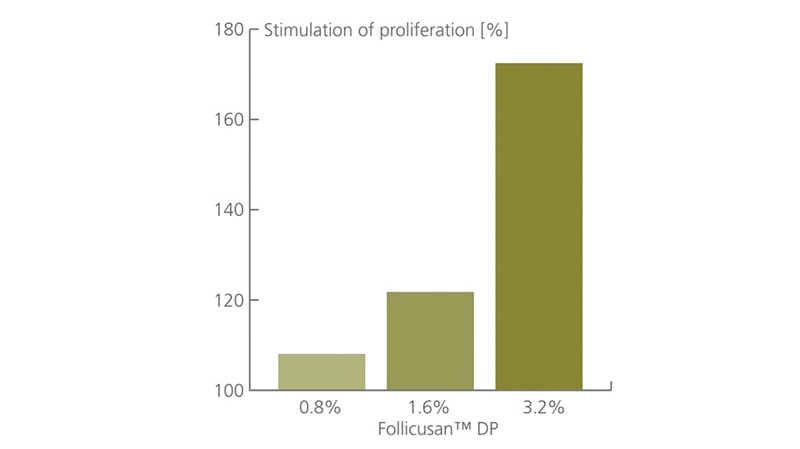 With daily use of Follicusan™ DP a positive trend could be noticed after only 3 months, indicating that Follicusan™ DP was able to re-activate the hair cycle. Pronalen Fibro-Actif is a standardized hydrosoluble extract of Germs of Soy and Wheat. It is made up of bioactive molecules which provide sufficient energy to increase the protein synthesis of the collagen, elastin and the glycosaminoglycans. Pronalen Fibro-Actif is incorporated into hair products as it revitalises the hair. It is a vegetable alternative to placenta extract, mimicking its function as a protein reconstructor that returns protein to the hair and repairs follicles. PRONALEN FIBRO-ACTIF is obtained from seeds with only water used in their germination and no pesticides and other chemical additives. The process is stopped after 7 days as the active biomolecules (peptides, amino acids, oligosaccharides, glucose) have reached their maximum levels. 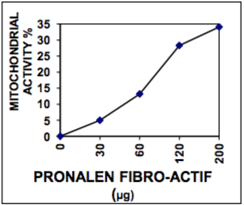 The first graph shows how mitochondrial activity increases with greater concentrations of Pronalen Fibro-actif (µg). In this case the concentration of the mitochondrial protein was 7.43 µg and the process was carried out without incubation. 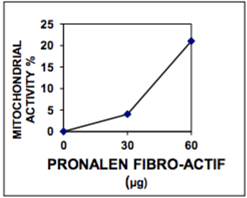 Figure 2 shows us the increase in the mitochondrial activity with greater concentration of Pronalen Fibro-actif (µg), as the oxygen levels detected in the cell fall progressively. In this case, the mitochondrial protein concentration was in the order of 12.23 µg and the process was carried out after 15-18 hours of incubation. Active caffeine helps to regulate the effects of testosterone. Male pattern baldness is known to occur in individuals with sensitivity to testosterone, causing damage to hair follicles that leads to baldness. Caffeine, a xanthine alkaloid, acts as a central-nervous-system stimulant in humans and offers significant benefits for the health and vitality of the scalp. Works by improving effects of hair elasticity, moisture retention and flexibility. Part of the vitamin B group which takes on a provitamin form and converts into pantothenic acid when applied to the hair. Panthenol can penetrate the hair shaft as well as the root of hair, thus giving hair an extra boost of B vitamin which helps thicken hair as well as promote hair growth. Botanical extract proven to help prevent testosterone conversion to DHT, a naturally occurring hormone in the body that contributes to thinning hair by shrinking hair follicles. Used as a scalp treatment and exfoliator, argan oil can address certain types of scalp conditions that are precursors for hair loss. Dermatitis, psoriasis, dandruff, dry scalp or seborrheic dermatitis (excessively oily scalp) can all cause itchy, burning, flaky scalp and will ultimately clog hair follicles and contribute to hair loss. A Propylene Glycol alternative, derived from sustainable and renewable corn sugar fermentation, that reduces skin irritation and delivers optimum ingredient absorption. Traditional Ayurvedic oil which cleanses the scalp, heals inflammation and improves hair texture. Contains extraordinarily high levels of antioxidants and protects the scalp skin from ongoing damage that is caused by free radicals. Neem also has regenerative properties that support healthy cell division and stimulate hair follicle growth and function. Adenosine is an important bio-organic compound fulfilling various functions in the human body. Recent research has proven that the application of an adenosine solution on the scalp can lead to improved hair growth for both men and women. Mitigates hair loss by stimulating hair growth and thickening of the hair shafts. An organic compound produced in a variety of plants, it has anti-inflammatory properties which can help alleviate a number of skin conditions. Azelaic acid also has mild antibacterial properties, meaning it can help keep the skin clean. As well as possessing these anti-inflammatory and antibacterial properties, Azelaic acid may also act as a 5α-reductase inhibitor. Researchers have reported that diets lacking inositol produce baldness in laboratory animals, but when the vitamin is restored, the hair grows back. Males seem to be affected most. Physicians have reported similar findings with human patients. Inositol is known to strengthen hair by helping it to retain moisture. Helps reduce inflammation and can soothe the irritation that other hair products might be causing. Contains an abundance of essential fatty acids (EFAs), including oleic acid. Emu oil helps transport ingredients through the skin, so it can help active ingredients to work more effectively. Amino acid groups known as copper peptides have two major properties: 1) as potently protective anti-inflammatory agents that limit oxidative damage after tissue injury and 2) as tissue remodeling agents that remove damaged protein and scar tissue and activate their replacement with normal tissue. Copper peptides are applied primarily to enhance wound healing. They also stimulate production of collagen and may enhance the action of antioxidants. Studies conducted at universities and other research institutes found that copper peptides improved hair transplant success, increased hair follicle size, stimulated hair growth, and reduced hair loss. L-cysteine plays an important role in keeping the overall hair health. L-cysteine is one of few amino acids that has the ability to form disulfide bonds in the body. These disulfide bonds hold together the keratin strands within the hair, which provide the hair with its fibrous properties that hold on to moisture and prevent hair dryness. Also, L-cysteine directly helps in maintaining the texture and thickness of hair. A constituent of vitamin B3, niacinamide occurs naturally in yeasts and various other foods. In bio-technical formulations, niacinamide, also called nicotinamide, is a heterocyclic aromatic compound that functions as a conditioning agent. Benefits of niacinamide for the treatment of skin conditions have received greater study over the last few years, and the crystalline basic amide is now formulated into advanced products for moisturizing, anti-aging, and rosacea. The compound is used in premium hair conditioners, hand creams, paste masks, lotions, powders, and sprays. A crystalline amino acid formed in the conversion of ornithine to arginine and found in the inner root sheath and medulla of hair follicles. Citrullinemia, a disorder of amino-acid metabolism accompanied by excess citrulline in the blood and urine, is often associated with skin changes like atrophy of the epidermis, thin and short collagen bundles, and dystrophic elastic fibers. Hair relaxers are associated with reduced citrulline and have been associated with inflammation. Essential oil which provides antiseptic and circulatory benefits as well as a soothing sensory experience. An essential water-soluble B-complex vitamin, biotin is one of the building blocks of healthy hair growth, needed to metabolize fatty acids and amino acids. The rich levels of biotin in Veta help strengthen hair, as well as combating dryness, breakage and loss. Arginine helps to form nitric oxide to feed and regulate hair follicle activity. The amino acid is a metabolic precursor of nitric oxide, an important signaling molecule, vasodilator, and mediator of cutaneous cell function. 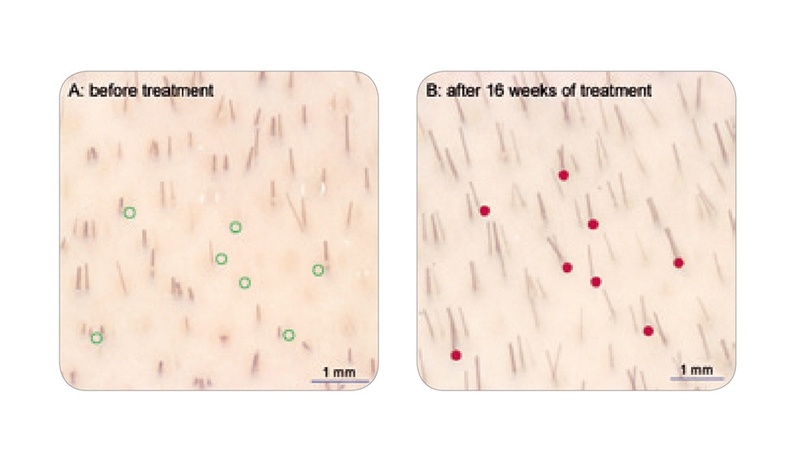 Improved blood flow and nutrition to follicles, as well as better overall regulation of follicle activity, allows for hair fibers of greater diameter. Antimicrobial properties keep the scalp protected from infection and soothe inflammation. High antioxidant content battles free radicals that cause damage to the scalp and hair. The oil has antifungal properties that help maintain scalp health. Aloe vera contains proteolytic enzymes which repair dead skin cells on the scalp. Contains vitamins A, C, and E. All three of these vitamins contribute to cell turnover, promoting healthy cell growth and shiny hair. Vitamin B-12 and folic acid are also contained in aloe vera gel. Both of these components can keep hair from falling out. A moisturizing, healing, anti-irritating, soothing, keratolytic and non-toxic chemical compound useful in cosmetic and dermatological preparation. An effective cell-proliferating and healing agent that stimulates good tissue formation. Amino acids that possess the same chemical structure as proteins, but are shorter in length. Peptides, or mini proteins, are active molecules that send signals to your cells. When collagen breaks down, it forms specific peptides that signal to skin to generate new collagen. By applying peptides topically, our skin can be ‘tricked’ into thinking that it has lost collagen recently and to generate more. Modern scientific evidence indicates that roots of the genus Panax, commonly called ginseng, prolong hair follicle life, exert antioxidant effects, boost the immune system, and provide many other benefits. Several plant extracts have been investigated for their ability to influence apoptosis, the genetically determined process of cellular self destruction. In multiple published studies of murine hair follicles, ginseng prevented apoptosis. It also aided formation of medullary cells in hair follicles. The mineral zinc is vital to the body, playing a key role in more than 300 biological processes, including cell reproduction, protein utilization and maintaining hormonal balance. It is essential to the synthesis process involved in creating and using collagen and is also a powerful antioxidant, healing wounds and strengthening the glands attached to hair follicles. An increasing number of studies have examined the efficacy of zinc in treating alopecia, showing positive results and opening new areas for further research. Menthol is an herbal compound that can help improve your hair's health and reduce hair loss associated with scalp conditions such as dandruff, eczema and scalp psoriasis. This menthol, an extract from peppermint oil, has soothing properties, especially for problem scalps. The cooling effects of menthol can alleviate scalp irritation and redness. It also keeps the scalp invigorated so that blood and, naturally, nutrients are allowed to flow to follicles.